The chainsaw you choose will ultimately come down to your personal needs, your physical strength, and of course, your budget. If you missed Part 1 of "Advice on Buying a Chainsaw," click here. A chainsaw isn’t a toy and can cause serious injury or death if you use it incorrectly. Before you head out the door to buy a chainsaw to take care of a fallen tree on your property, familiarize yourself with how a chainsaw works and how well you will be able to use it. The length of the guide bar and chain determines how large a tree you can cut. For the safest and easiest cutting, the bar should be 2 inches longer than the wood you’re cutting. To cut up a 12-inch tree, you would want a chainsaw with a 14-inch bar. You could use a 14-inch bar to cut a 28-inch log, but it will take two passes and isn’t as safe. For the average homeowner doing the occasional light cutting of small trees, a bar length of 12 to 14 inches should be adequate. For larger trees and more regular cutting, 16 to 20 inches is more practical. Chainsaws that can accommodate a bar length between 22 to 36 inches are more for the professionals and for heavy duty, large tree felling. If you need to bring down a very large tree, consider calling a professional tree cutter. Electric and battery-operated chainsaws typically have a bar length of 14 to 20 inches. Most poles saws have a guide bar of 8 to 12 inches. The longer the bar length, the more difficult the chainsaw will be to handle which increases the chance of injury. Kickback is a term for when a bar hits an object other than wood or becomes pinched within the tree or log and suddenly rotates or kicks back toward you. Kickback can be very dangerous and most smaller chainsaws come with anti-kickback features. Engine power must also be considered in addition to bar length. 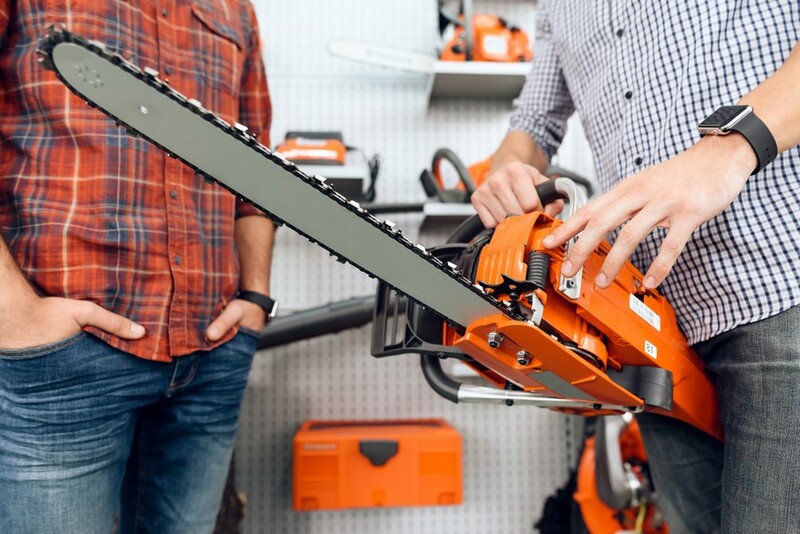 A large bar might fit on your chainsaw, but the engine may be too small to power it. Gas chainsaw power is dependent on the engine size which is measured in cubic centimeters (cc). The higher the number, the more powerful the engine. For small trees, 30cc to 40cc is adequate. Large trees and logs require 50cc or higher. Large engines weigh more so bigger isn’t always better. Electric and battery-operated chainsaw power is measured by amperage or amps. The higher the amps, the more powerful the chainsaw. Using a chainsaw requires a certain amount of physical strength. 10 to 15 pounds might not seem like much at first, but after 10 minutes of holding, cutting, and controlling the chainsaw, fatigue can set in. When buying a chainsaw, determine what you can physically handle. A chainsaw that’s too heavy or not balanced right can lead to injury. This feature minimizes the vibration of the bar which allows you to use the chainsaw for longer periods of time. Severe vibration can lead to numb hands which can lead to injury. A system that lubricates the chain as it cuts for safer and more efficient cutting. A braking system that stops the chain from spinning in the event of kickback. Stops the motor from overheating and burning up if used beyond its limits. A feature that makes the chainsaw easy to start (highly recommended). Protects your hand from the chain if it comes loose or breaks. Allow you to easily add fuel oil without the need for extra tools. Another feature that makes the chainsaw easier to start. A button that stops the spinning of the chain almost instantly. Chain tension adjustment feature which requires no tools or touching the sharp chain. Prevents accidental operation of the throttle by making you set the throttle lock before you can push the throttle. The chainsaw you choose will ultimately come down to your personal needs, your physical strength, and of course, your budget. A good chainsaw isn’t a cheap item, and if you don’t think you will use it very often, you may want to pay someone to bring down a tree and cut it up for you. If the idea of being able to cut up your own firewood is appealing, then a chainsaw will soon pay for itself. Just make sure the chainsaw has enough power to cut the size of your trees, has all the latest and greatest safety features, and is comfortable to carry and use. Missed Part 1 of "Advice on Buying a Chainsaw"? Click here to get up to speed.